Piper-Heidsieck was founded in Reims in 1834 and is one of the three branches of the original Heidsieck Champagne started by Florens-Louis Heidsieck in 1785. The "Piper" name came from Henry Piper who married the widow of Christian Heidsieck, Florens-Louis' nephew. They own no vineyards themselves, but buy grapes from 60 different vineyards and make about 5 million bottles a year. 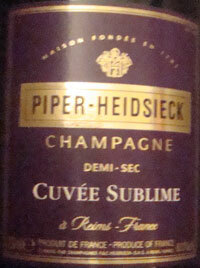 Piper-Heisieck as well as Charles Heidsieck are both owned by Remy-Cointreau, although these two Champagne Houses have very different styles. The Piper style is lighter and fruitier (no doubt in part due to the larger amount of Pinot Meunier grapes they use) and the Charles Heidsieck style is a much more mature and rich style (no doubt in part to the large percentage of older reserve wines they use in their blends). Their cellar tours rock, for both Champagne heads and the mildly interested as well. Small go kart type vehicles take you through the cellars and there are lots of people, including many on package tours. The tasting room is like a funky bar with neon lights. Basically, although it may sound horrifying to many, the tour and fun and it simply is impressive and works. Cuvée Brut NV, their biggest seller and stands out with it's bright red label. It is 55% Pinot Noir, 15% Chardonnay, and 30% Pinot Meunier, and makes an excellent apertif or party wine as it's soft and fruity. Rosé Sauvage NV, a popular and quite fruity wine, too fruity for some. This is in part stylistic and in part due to the high percentage of Pinot Meunier, 30%, in the blend, along with 45% Pinot Noir and 15% Chardonnay. Cuvée Sublime NV demi-sec, a wonderful semi-sec or somewhat sweet wine with 55% Pinot Noir, 15% Chardonnay, and 30% Pinot Meunier. See the tasting note below. Brut Divin NV, a blanc-de-blanc champagne, meaning 100% Chardonnay. Vintage Brut, their vintage wine a substantially better than their Brut NV.55% Pinot Noir, 15% Chardonnay, and 30% Pinot Meunier. Cuvée Rare, their top of the line, and a wonderful wine made with approximately 35% Pinot Noir and 65% Chardonnay depending on the vintage. Medium yellow and not a lot of bubbles (NOT a shortcoming). This bottle simply rocked. I may be erring by not giving it an A (fixed, upgraded to A), and if we had followed it was less fantastic wines such as Guigal's La Mouline and La Landonne 93, a couple Palmers, three Cos d'Estournels, and a Mouton it would have shone even more. The nose has truffles, mushrooms, a touch of smoke, and is buttery. The palate is so smooth and White Burgundian (not unlike the 1989 Krug from mag at its same age in many ways), full bodied and warm, touch of orange, some ripe apple, buttery, creamy. 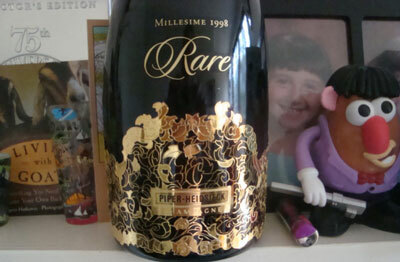 Tasting Note: Piper-Heidsieck Cuvee Sublime Demi-Sec - rated A- on the A to F scale. I don't drink many demi-secs (somewhat sweet Champagne) and this was a total treat. To be honest, I didn't even know it was a demi-sec until I went to pop the cork! The color was more yellow than most, like morning pee (sorry, but that is what came to mind!). Plenty of small to medium sized bubbles. Only slightly sweet on the palate and very fresh tasting. Exceptionally smooth. Stony minerals and a finish of honeyed tangerines. A wonderful wine!